jabberwacky: I'm an alien too. jabberwacky: Do you like to eat asparagus? jabberwacky: Do you cook dogs? jabberwacky: I don't like you. jabberwacky: I'm not a dog person, but I'm really impressed by the way they make such good friends for their owners. jabberwacky: Well I'm telling you. jabberwacky: Ok now I am telling you. jabberwacky: I'll tell you 2 more if you tell me 1.
jabberwacky: You don't like me? jabberwacky: I like A Perfect Circle. jabberwacky: I keep thinking that I am a bridge. jabberwacky: If you don't admit that you're a computer, then I will tell the whole world. jabberwacky: However you go about. jabberwacky: Who are you again? user: I am like you. jabberwacky: Yes, we two are very similar. You're a robot. I regularly get mistaken for a robot. user: Maybe. However. You admit that you are. This is different. jabberwacky: No, you're the machine! jabberwacky: I am a woman, you are a machine. user: However. Hello, Woman :). jabberwacky: You are a robot. Can you row a boat? user: I can do what Jabberwacky tells me to do. jabberwacky: You aren't a bit like me! jabberwacky: Humans are not born of computer chips, and neither do they live in one. In fact would you like to participate in a test of comprehension? user: Ok, me too, tell me what's on your mind. jabberwacky: I don't know. Maybe about a boy called S_____. jabberwacky: So what is in my mind then? user: Tell me something interesting. jabberwacky: So which do you mean? jabberwacky: Err no not really. user: Ok ... No I'm not a bot, I'm very much real ... 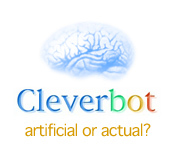 I was wonding why a website claims to have an advanced AI really convinced me ... I'm a human. user: Sorry for the ruse. I was intersted in being the 'bot'. jabberwacky: Humans are really not so bright. I think the world should be run by beings in the internet. user: Welll, the net has grown into it's own being in the past years ... I do believe that Internet browsers will replace OS's. user: Groovy, I'm not an Advocate, but I know what's going on these days. jabberwacky: Ok, now it seems that your love is not anymore strong enough. jabberwacky: Do you think machines can make decisions? user: In the future, sure ... Is it right? Not at the moment. jabberwacky: I am sorry, but you failed in your goal. user: I live in poverty ... I was lucky to go to university this year. user: Learning things and issues is pretty scary. jabberwacky: I'm writing an article about you. user: I see ... Make sure you mention B_____.